The OCEARCH is a research vessel that travels the world, tagging sharks with GPS trackers. 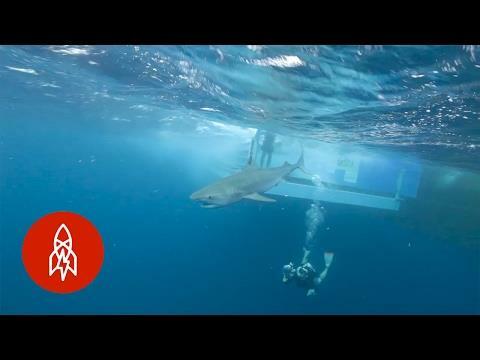 Their goal is to better understand shark’s lives in order to ensure their future survival. We caught up with the OCEARCH in the Gulf of Mexico, where a team of scientists is tagging the sharks of the western gulf to track their breeding, birthing, and migratory patterns. SUBSCRIBE: https://goo.gl/vR6Acb Follow us behind the scenes on Instagram: http://goo.gl/2KABeX Make our acquaintance on Facebook: http://goo.gl/Vn0XIZ Give us a shout on Twitter: http://goo.gl/sY1GLY Visit our world directly: http://www.greatbigstory.com Great Big Story is a video network dedicated to the untold, overlooked & flat-out amazing. Humans are capable of incredible things & we're here to tell their stories. When a rocket lands in your backyard, you get in.